Booth Road Celtic despatch Leicester Celtic. Booth Road Celtic lose to Ardmore Rovers. 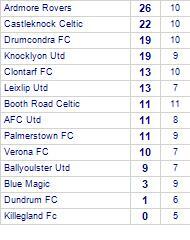 Booth Road Celtic are currently on a losing streak of 6 games.They have yet to win at home. 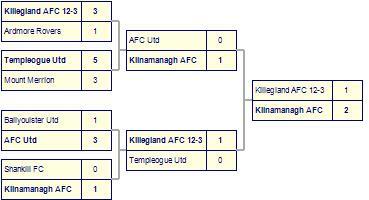 Ardmore Rovers has yet to be beaten in this competition, having won 5 out of its last 6 games. Booth Road Celtic are defeated by Palmerstown FC. Booth Road Celtic draw with Cabinteely F C S D.
Booth Road Celtic has yet to be beaten in this competition, having won 2 out of its last 5 games. 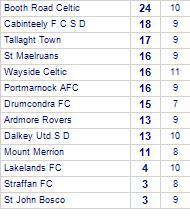 Cabinteely F C S D has yet to be beaten in this competition, having won 3 out of its last 5 games. 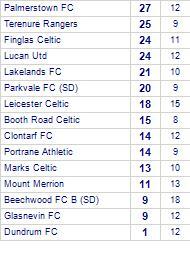 Booth Road Celtic take spoils against Lakelands FC. Booth Road Celtic despatched by Verona FC. 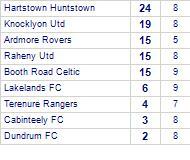 Lucan Utd lose to Booth Road Celtic.